Lightshine LLC was established in 1981 in Dubai, UAE. For more than 3 decades, Lightshine has been providing smart solutions to its valued customers. Lightshine has been providing quality industrial equipment and supplies for decades. All products are hand-picken from the most reputed manufacturers in the world. Also as pioneers of electrical and arc flash safety in Middle East, we have now expanded our products to cater all your personal protective equipment needs. We a professional team across sales, operations, and customer service, we ensure satisfactory experience of our clients. If you are working on or around electrical systems, rest assured that we will have you protected against different hazards. We have been thinking about you while taking each and every step during last 30 years to make sure you will enjoy a premium experience when using our products. Our range of products are chosen from leading manufacturers of the World. This is only for you to have peace of mind while using our wide range of products. Most of our suppliers are among pioneers of their industry. Some of them have been setting standards in their industries. You are always assured of fastest possible delivery which leads to lower expenses for you, thanks to our local inventory. When you need something to make your workspace safer, you should not worry anymore. Just call us and have it delivered to you at the earliest. Lightshine has gathered a wide range of products from leading global brands available locally for you including Honeywell, Salisbury, Utility Solutions, 3M, Karlens, HD Electric, Klein Tools, Chance, Charnaud, Workitalia, AGO Safety, Electrosoft, Smart, Howard Leight, North Safety, DuPont, Sperian, Miller, and a lot more. Throughout more than 30 years of active presence in Middle East market, we have supported many of different markets segments including but not limited to utilities, marine, oil and gas, heavy industries, government, military, and small industries. You are more than welcomed to get our detailed references report stating all happy customers from our customer service team. As pioneers of electrical and arc flash safety, many of local endusers have prepared and implemented electrical safety codes with our close collaboration. At Lightshine, we believe that your time is important. That is the core motivation behind starting our new online store, first of its kind in Middle East for personal protective equipment. Now, you can easily login to www.lightshine.ae, explore different products and choose what you need virtually from anywhere at anytime. So Lightshine could now be reached 24 hours via online store. We still operate the old-timer's way through fax and phone also to satisfy needs of all customers with different tastes. 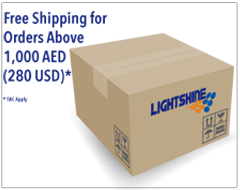 Lightshine has 2 offices in Dubai, UAE, the hub of Middle East trade, and has local inventory in 2 warehouses in Dubai and Jebel Ali to easily accomodate fast deliveries to GCC, Middle East, and Africa markets. Now, enjoy browsing our wide range of products and shop on our online store from anywhere at anytime. Do not forget that our experienced customer service team will always be more than glad to assist you. Just call us, fax us, mail us, or simply visit contact page of this website to write to us!